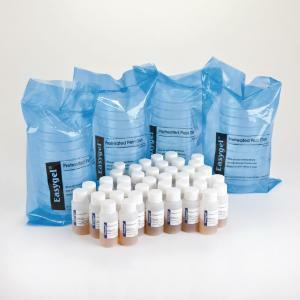 This convenient, one-step media starts as a liquid and gels when poured into the provided petri dishes. No heating is needed, which reduces preparation time in the lab and makes it easy to take samples on field trips. As with traditional agar methods, you can add your sample to the liquid medium to create pour plates or let the gel harden to make streak plates. Ordering information: These products contain living or perishable materials. Easygel comes in a variety of types. The pre-treated petri dishes measure 100 x 15 mm. Shelf life is six months.